Views, also known as “List Views”, are an important way to view and access data in Propertybase. A view is a filtered list, based on predefined criteria, that allows you to represent your data anyway you would like. Records can be viewed by clicking any object tab. Records are then displayed in List Views. In the example below, we are using the Contact object. By default, records are listed by Recently Viewed. This is just one type of a List View. 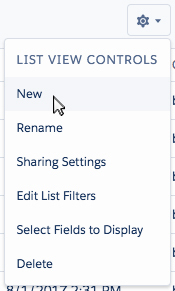 You can switch list views by clicking the current view and selecting from the available options. 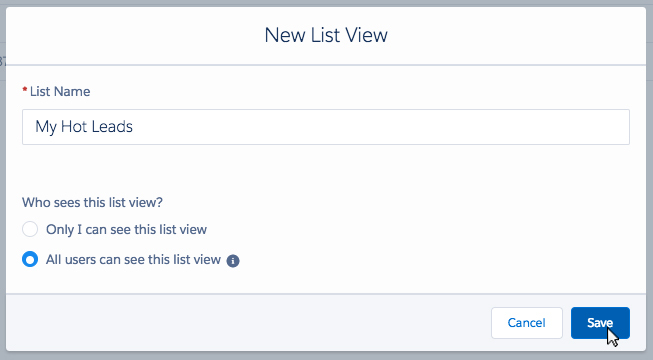 Custom list views are based on individual business needs and are built using preset criteria. For example: a list view titled “Hot Leads” could potentially show all contact records that match a Lead Ranking criteria of "Hot". To create this List View, click the Contacts Tab. Next click the Gear Icon and then click New in the dropdown menu. For List Name, enter My Hot Leads and select All users can see this list view. Click Add Filter on the right side of the screen. For Field select Lead Ranking, for Operator select equals and for Value select Hot. Voilà! You just created a custom list view. After you've put your data inside of the Propertybase application, you obviously need to find ways to access it. And in Propertybase, just like all of the force.com products, the most typical way to access any data is through a view. A view is really just a group of contacts filtered on some sort of criteria. Now I'm going to use contacts for this example, but keep in mind we could use any object to create a view with, whether it be listings or authors or whatever it is that you would like to manipulate. So I am logged in, and at this point as the system administrator, this procedure is the same regardless if you're a user or a system administrator. The only difference is the system administrator can force a view to make it available for everybody. So everybody-- all your users can create their own custom views to see just the data they want to see. And a lot of people aren't really sure where to start by accessing their data, so the easiest way to find any data, of course, is in search field. But after that, we may need to access sets of data regularly, and that's where the views come in. You might also have heard these before, called pre-defined queries, if you're coming over from another CRM product. So if you look here, there's a list of all of your views. And what we see here on our first screen is actually just a list of the recent contacts that you see. And the first difference I want to point out here is the All Contacts or the My Contacts, and the differences there-- the ownership. The ownership is the contacts that are assigned to use it you that you own as the record owner. So I'm going to go into the All Contacts view and that's going to see all of our contacts. Click on Go, and then once we get there, we have a big list. This is called a list view of all the contacts that we have. We can sort through them alphabetically or sort by the column. So this is obviously a large, rather unmanageable list, so maybe we want to look at it by whom I have a birthday this month I have, for instance, if that's important to you If you send out birthday reminders, you can see it's sorted by the birth date-- or it includes a birth date. And this includes everyone with a birthday in May because it happens to be in May right now. And then another interesting view is New This Week. If you're using a web connection between your website and Propertybase, this might be relevant because you really want to see who's been created this week and who-- and what records you may need to follow up on. So let's go ahead and create a new view at this time. So we check on Create a New View. We want to think of a name, so obviously it should be a logical name. So we could say, for instance, "New Today." We can say even "New Leads Today." So I'm using this to show you how to get this down to exactly the data set you need. We go to the unique name, which populates automatically. We want to see all contacts, or just mine that are owned by me. I want to see all in this case. And then we can filter by fields. So New Leads Today-- so the first thing is that there is a Status Field by default-- I'm sorry, Stage Field. We just pick up the Stage Field, we'll use an Operator, and we can click on this that gives us all the options that we have in our picklist. We want Leads, and Insert. So now we have-- it's going to show us all the leads, and New Today. So that's-- the field is called Create A Date, which is right here. Equals and, for this, we can use just a simple literal Today. We can also add filter logic based on Excel formulas and something like Excel formulas, which is sort of the default Salesforce or force.com language. You can learn more about that in the contextual help section right up here. You can check that out. And then next, you want the fields to display. So maybe that's the list view that you see when it pops up. So what you want to see is that, for instance, we have the name, the company name, the title of the person. Maybe we want to see their city and maybe want to see their mobile phone number so we can give them a call really quickly if we need to. And maybe it's a good idea to see their lead source-- where they came in from. So now we have a view we've created with the Lead Stage, and the Create A Date equals Today, and we're going to see this data on the list view. So, fourth step-- we want to keep this visible only to me. This is going to be a personal view. This is what a regular user will be by default. And then if we want to make this visible to all users, we can do that as well. I'm going to leave it just for me at this point, and I'm going to click on Save. And there's our view. And this pops up right into the new view. Something to point out here. You can control the amount of records you display on your screen. I have it set to 100. It can be a little slower, but not appreciably. So I keep it set there. And you can see that here's our list view with the name, company name, title, phone number, email, phone, and lead source of the leads that have been created today in our property base. So that's how to get in and create views. Actually, this is something you can jump in and play with to your heart's content. It's not something you can break. So the best thing is to just jump in and create some views, and check out the helps if you're a little bit confused. And there's also going to be a lot of good information about creating views out there if you type in a Google search because this is standard force.com or salesforce.com functionality. What are views in Propertybase? Views are the key to accessing your data. 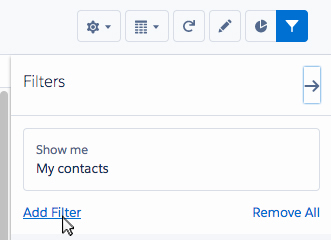 Views are simply filtered lists of your data in Propertybase, allowing you to specify what you want to see, and how you want it to be represented to you in your profile. Views can be created on any Propertybase object. It's important to know how you can access your data, and how to make the views available to who needs them. How to customize a view? To create a custom view click the relevant tab e.g., Company, Contact, Listing etc.. Click the 'Create New View' link next to the view drop down menu, as below. If you can't see this link please contact your Administrator, as your Profile needs this permission set. This link will open the 'Create New View' Screen. Then go through each of the steps. Step 1 - Enter the name of the new view which you would like displayed in the drop down view menu. Step 2 - Filters are applied in step two. You can add filters base on standard and custom fields as seen below. In this example, we will see 'all contacts created today'. It is possible to add multiple field criteria and change the filter logic for a more in depth list view. Step 3 - Will allow you to select fields to display in the view. Default fields are automatically selected. There is a maximum of 15 different fields to display in your view. Only fields that are displayed on the page layout are available. If a long text area field is selected, up to 255 characters are displayed. *Step 4 will only be visible for system administrators to push these views to all users or to keep them private. Upon finishing your list view simply click the "Save" button. If you want to use views to edit many records easily, you can activate inline editing. Please make sure that you have limited the view to one record type. Read more here.